For some, a debilitating chronic disease is nothing more than a death sentence. For others, it's an invitation to dance with destiny – and with the Devil. This is where the younger generation lives, at least. We soon learn that a devastating disease, likely caused by toxic pollution, has triggered a widespread epidemic of unchecked leg growth. At some point in their late teens, the population's legs start growing longer (usually beginning with the right leg) at the rate of an inch or two per week; after a few months, they can't even fit in their trailers. Most become ostracized loners (pejoratively referred to as “Graffies,” a slur based on their long giraffe-like legs) who roam the landscape trying to survive against The Elders, who ruthlessly hunt Graffies for their prized extra-dense leg bones. But Wade Watts is different. Unwilling to accept his tragic fate as a Graffie, Wade boldly approaches the leaders of The Elders (played with taciturn malignance by Ben Mendelsohn and Mark Rylance) with an ingenious proposal: if they give him a chance, he promises, he will round up and deliver to them all the tibias they could ever want. In an effort to bring this desperate improvisation to fruition, Wade convinces the other Graffies they're actually part of a special government test game, building a deception as massive as his softball-sized patella. Wade's endgame is unclear, and things spiral out of his control, landing with a disturbing (but logical) twist involving spurs and break dancing. At times Ready Player One plays like a cynical, forward-looking extension of Saving Private Ryan – Spielberg seems to be drawing a rather heavy-handed comparison between the Greatest Generation and what he sees as increasingly entitled younger generations. One scene actually mirrors Saving Private Ryan directly. Wade (the analog to Matt Damon's Private Ryan) gives an emotional monologue to Mark Rylance's Anorak (analog to Tom Hanks' Captain Miller) where he recounts being at the zoo as a young child, throwing what he thought were rat poison packets into the giraffes' enclosure (realizing too late they were only tea bags). Even if the scene strains credibility, Tye Sheridan does some of his strongest dramatic work here, and Rylance is as generous a screen presence as ever. 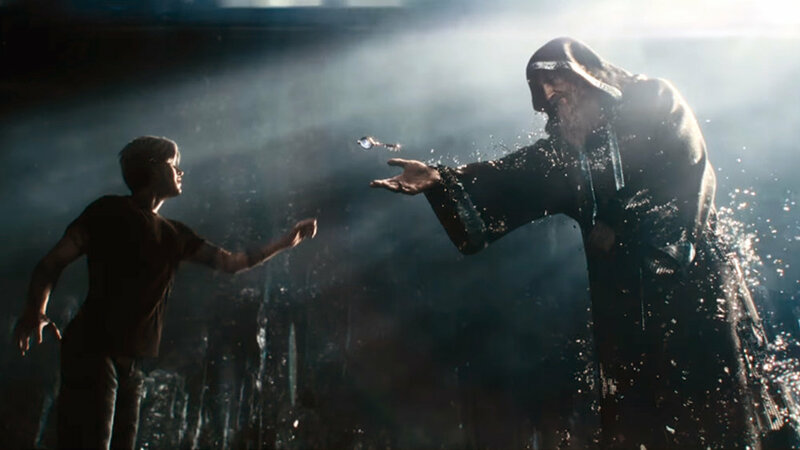 Much of the film's CGI – for many, a point of worry and derision after the film's first trailer – is actually handled well. The teens' out-of-control leg growth (an extension of real-life disease Marfan syndrome) is rendered in graphic detail, and “the stacks” are a bleak but glorious dystopic vision. But a recurring dream sequence involving giraffes whose necks shrink while their legs grow even longer falls on the side of cartoonish (there were snickers in my screening). Alan Silvestri's score is serviceable, but the real treat here is a climactic showdown set to West Street Mob's “Break Dance – Electric Boogie” – even as the gore flies, you'll be jamming in your seat. As a follow up to The Post, Ready Player One admittedly feels like a non sequitur. But despite a few stumbles, Spielberg ably corrals viewers into contemplating with whom they identify most: Graffies or Elders? And how different are they, really? Only Steven Spielberg could combine such hefty existential quandaries with the kineticism of hand hops and air flares. With any luck, you'll be doing your own headspin as you leave the theater.